Hear what you were missing ! * The Electronic Stethoscope is designed for cardiologists, chest physicians and doctors who need better auscultation features than the conventional stethoscope. * It is also recommended for doctors with hearing loss. Stethmate makes medical auscultation a pleasure. EEC's Electronic Stethoscope produces powerful and crystal-clear amplification of heart sounds, respiratory sounds and faint murmurs. It has convenient finger-tip Volume Control and a Filter switch to differentiate sound of variable intensity and pitch. Stethmate has special noise-reduction circuitry that minimizes external noises.This handy pocket size unit works on a 9 Volt battery. An auxiliary output is available on STETHMATE for connection to a ECG machine/Cardiac Monitor for Phonocardiogram recording ; or, to an external tape recorder, amplifier/speaker system for group listening. 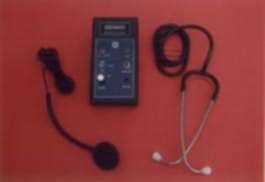 Doctors kit,Medical Diagnosis,ENT doctor,steth,electronic stethoscope. medical examination,diagnostic aid,hearing aid for Doctors,PCG,P.C.G. diagnostic aid, diagnostic equipment, medical instrument,Biomedical.